And it’s not even like I’m actually packing anything yet. Right now I’m in the sorting phase. Okay, so I hate sorting. I’m trying to go through all of these folders full of receipts from the last two (or twenty) years. They’re stacked in four or five inch piles around me in a circle on the floor. I pick up a faded blue and yellow receipt with a brown-eyed baby on it from The Juvenile Shop. Kyle Richard’s voice (“Real Housewives of Beverly Hills”) blares from the TV on the wall. I lower the volume a little with the remote next to me and close my eyes. Jesus, he’s graduating from high school in two months. I’ve been so busy getting bids from moving companies and getting rid of stuff that I haven’t even really thought about the fact that Justin will be living on a college campus in the fall. Come August, my baby will be a college freshman. The next thing I pull out is a photo of Miles from his 10th birthday party. I’d had it made into a thank you card. I stare the glossy photo with his new 10-speed bike and handsome smile until I find my eyes burning and swelling with inconvenient tears. The reality that I’ve been avoiding is, that for the second time in four years I’m saying goodbye to another major chapter of my life. Four year’s ago, I moved here to Encino from my martial home in Studio City, where I’d lived for 15-years with Brian, Miles and Justin. They spent their high school years in this house. This house, which is the first house I ever bought all by myself and decorated to suit my taste (I didn’t even know what my taste was before this house). Scottie and I waited for six years and then finally, four-year's ago, moved in together in this house. And now I’ve just sold this house because “we’re at the top of a sellers market” and “it’s a smart move for my future”. But being responsible for my future means I don’t get make decisions based on how I feel anymore. Because I really don’t feel like moving and I really don’t feel like packing. And right now, I really don’t feel like sorting through everything I own in order to purge things like this precious crib mattress receipt and those decade’s-old thank you cards. Saying goodbye to these things means saying goodbye to those massive after-basketball sleepovers, Sunday dinners, family road trips, movie nights, etc. Saying goodbye to these things might mean a transition into a lonelier way of life that I’m just not prepared to lead right now. I hit the home button on my iPhone to see the time. 7:15pm. I’ve only been at this for twenty minutes? No place like home! Kim Kardashian and Kanye West 'FINALLY move into $20 million mansion' after renovating property for year! It’s not like I’m one of those “Dash-fans” (is that what they call them?). I mean, I can count on two hands the number of times I’ve seen “Keeping up with the Kardashians” (Okay that’s a lie. I’m pretty sure I watched it regularly for at least a year. Well, maybe it was three or four seasons, but they’re really short seasons, aren’t they?). I feel my scalp tingling with a familiar mixture of envy and curiosity. I put the snow-globe down and flatten out the page in front of me on the floor with my hands. Obviously there will be areas built for personal maintenance. There are plans for a huge gym, basketball court, hair salon and a full spa complete with a facial and massage room. My face flushes with instant annoyance. By the way, did I ever mention that I represented Robert Kardashian (the Kardashian dad) when I was a publicist? I was working for Prudence Baird's PR firm and Robert Kardashian's company, Movie Tunes, was just launching. It was a big deal then because he had just finished the OJ trial. He was part of that defense team — the Dream Team. Remember he was the one who carried that mysterious briefcase to the trial everyday? Kourtney, Kim and Khloe were all just cute, little girls then. He was a really nice guy. Who knew then that his offspring would grow up and become one of the richest, most powerful dynasties in the world? Suddenly I feel sticky inside, like I’ve been tarred internally. I feel my eyes glazing over like I’m high on cold medicine. I can’t believe that I would actually think twice about Kim Kardashian’s spa room if my blood sugar was normal. But my body doesn’t seem to want to stand up, so I lean my head back against the wall. Now, Real Housewives’ OG, Lisa Vanderpump is quietly berating Erika Girardi (in her posh British accent) for being so self-obsessed. Really? Isn’t that kind of the point of all of those “Real Housewives" shows? Aren’t you all self-obsessed? With my eyes still closed, I blind-reach for my Evian bottle and take a swig of water, swishing it around my mouth before swallowing. The water feels cool on the back of my throat. Maybe this is a case of “analysis paralysis”. Maybe I can’t do this sorting because I’m incapable of getting rid of anything. It says here that Kim's organizer, Carla, is taking "great care" with all of the details that Kim wants so that the house is done right before she moves in. But an organizer would probably blow my whole moving budget. And this whole move is about me “downsizing” — spending less, saving more, being smarter with my money. I wonder how many people it took to move Kim and them into that twenty-million dollar mansion? With the magazine still in my hand, I head over to my computer keyboard. How much is an organizer? What do professional organizer’s charge? I click on that and hold my breath, doing some quick math in my head while it loads. The backyard is a mass of dust and dirt with construction vans and even a mobile office planted where a lawn and flowers should be. The pool is just a slab of concrete right now and the pool house has yet to be painted. Not exactly a lush landscape for little Saint, aged one, and North, aged four. Hey - what’s this? Kardashian squalor? Sure enough, it looks as though the Kardashian compound’s back yard is nothing more than a few piles of dirt and clay. I can’t help but smile as I push myself away from my computer. I stand up and stretch as I look around my office. 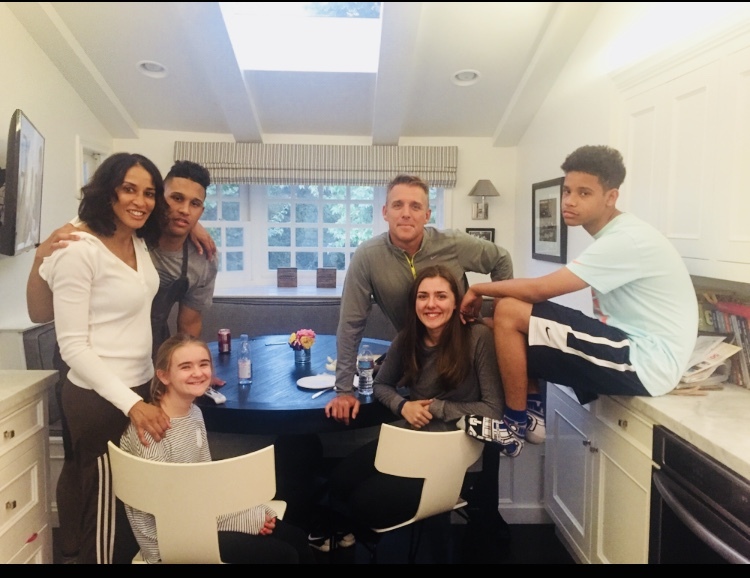 And Lily (Scottie’s oldest daughter) and Chris (my brother) will both be here in LA going to college in the fall. And Justin will just be in Orange County and will be home every weekend. Miles already comes home two or three times a week (and he comes every Sunday to make family dinner). Plus Nora (Scottie’s almost-14-year-old) will be flying out from Stowe, Vermont every chance she gets (and I’m pretty sure she’ll be coming to LA for college too). We’re going to have a full house. My stomach growls loudly suddenly and I remember that I was going to eat something. As I head toward the kitchen, I stub my toe on the large snow-globe and then quickly trip over two of the larger piles of receipts, scattering them everywhere. It looks as though a paper bomb has just been detonated in my office. After releasing a string of whispered curse words into the air above my head. I limp back over refresh my computer screen. I pick up the magazine again and stare at the photo of the Kardashian's disheveled back yard. In the picture above, Kim looks so secure and confident, like she's all "Yeah, so what my backyard's a mess? I'm owning my sh*t!" My laughter startles me (it also may sound suspiciously like crying to a passerby). I lower my shoulders and force myself to exhale. "Just wait 24 hours before you take any action on this idea and see how you feel then," (that's Beverly's voice again). "Okay Beverly," I say out loud (like crazy person). "Twenty-four hours." I step away from the computer and turn toward the kitchen again. "Thank you Beverly," I whisper. Glancing back at the page on the floor, I feel myself smiling again. "And thank you as well, Kim. I might need to just start owning my sh*t too." Remember how I used to call you my big sister? Or Barbie, because of your long blond hair (and you use to call me Francie). "Remember Francie?" You'd say. 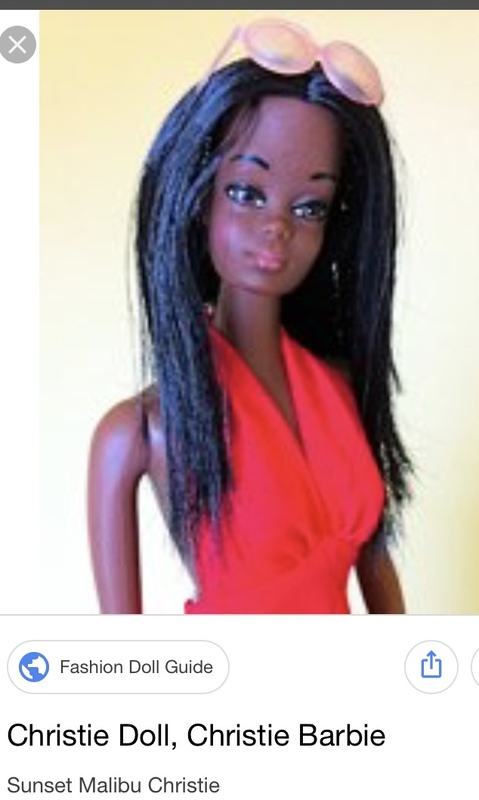 "Barbie’s Black friend?" Can you picture us way back then? Do you remember my kid's first day of pre-school? Kindergarten? Fifth grade graduation? First day of High School? Of course you do. Because you, my friend, were always there; giving me perfect “mom” advice, telling me cute stories about your hedge fund husband and flaunting your suspiciously toned after-baby-body (“Laura, you should really try this new hot yoga”). You were there telling me (over and over) about your kid’s perfect test scores, while at the same time complaining that he wasn’t “challenged enough” in his AP physics class (meanwhile Justin was struggling through Algebra 1 for the second time, but that’s okay). Of course, I was there for you too, listening patiently to each re-telling of the story of how you surprised junior with a new Audi A6 when he got into MIT. I was there helping you pick out the color for your 50th birthday-Maybach (although, now I'm thinking that maybe Emerald Green Metallic might have been a mistake). And don't forget, I was also the first of your friends to like and re-post your 2016 Instagram about your kid making Palm Beach Magazine's 50 most eligible bachelors under 25. Don't you think that only a true friend would go out of their way to promote someone else's highly privileged, overachiever kid (no offense)? By the way I’m not all bitter about the fact that your kid graduated from high school a year before Justin (even though he’s almost 15 months younger). All right, maybe I am slightly salty about it, but the truth is that still I appreciate your advice and your company (most of the time). However, I wanted to make sure that I let you about a few things that have been on my mind for a while. Like, you were wrong about some stuff. Now don’t get defensive. You were right most of the time, but there are some stand out places in my life where its possible that you might have given me some bad intel. For instance, (I know I’m going way back here) but you were wrong when you told me that I would LOVE being pregnant. You said that I would revel in “carrying LIFE inside of me.” That I would feel more feminine than I had ever felt. You made it sound like it would be one big slow-motion romp through a daisy field. Well sister, I'm sorry to break it to you, but I hated being pregnant. And it wasn’t just the morning sickness (although that leveled me for the first trimester each time). But Miles (and then Justin one year later) moving around inside of me really freaked me out. I felt like I had the life-form from Alien in my stomach trying to punch and poke its way out twenty-four hours a day. My back hurt all of the time and I couldn’t ever really find a comfortable sleeping position. I couldn’t wait to get that baby out of me. So like I said, you were wrong about that. I did not love nursing (okay, I really did enjoy the bonding -- the smell of their tiny heads and the small, sweet sucking noises they made while they played with my hair). But after they finally finished, it felt like I had two painful, overly full water balloons surgically implanted into my chest. I was constantly leaking through my blouses (damn those awkward nursing pads!) and running to rest rooms to find an outlet and some privacy so that I could pump. And when I realized that I was the only one who could do those middle of the night feedings…What?! Sorry (not sorry), I just did not like nursing. You were also way off base when you said that I should never sleep with my kids (You know what I mean. Okay – co-sleep, is that better?). First of all, most of the world co-sleeps with their children. Kids sleeping in a separate room is some nineteenth century, American-brought-here-from-Europe-custom that has less to do with the health and welfare of the child and more to do with class, prestige, etc., (look it up, its real). Did you know that in the parts of the world where co-sleeping is still practiced (which is most of the world, including Japan), solitary sleeping is thought to be cruel and is used as a punishment? So, yeah okay, maybe there was an extra mattress on the floor in my bedroom for a few years after the boys were too big to sleep in bed with us (all right, the mattress was there through middle school). But sometimes my kids felt safer sleeping near us than in their own rooms at night. And it’s not like they’re still doing it or they don’t know how to get to sleep by themselves now. But you did say that co-sleeping would put a strain on my marriage. I gotta give you that one. I mean, it certainly didn’t make it any easier (hello legal separation). And by the way, thanks for never saying, “I told you so” when we finally got divorced. There’s more. Your prediction that I would “need” to go back to work when my kids started school (because I wouldn't be satisfied with “only” being a mom) was erroneous. I have never been more satisfied (true, I was bored, frustrated, teary-eyed and out of my mind at times) but I was never dissatisfied. I love(d) being an at-home-mom. Besides getting sober, staying home to raise my kids was the hardest and most rewarding thing I’ve ever done, and I wouldn’t have done it any other way. Last thing, you were also wrong when you said that Brian and I shouldn't have been "so happy” when our solid C students finally started bringing home the occasional B. (“If I got excited every time my kid got a B, would he ever have worked so hard for his A’s")? But what you couldn’t understand is that our sons aren't cookie cutter kids and we didn’t care if they got A’s. I know it sounds like a cliché, but all we really ever wanted was for our kids to know that they are loved and to teach them how to survive and hopefully thrive in this world of ours. Our kids may never be Valedictorians or attend an Ivy League school. I tried to tell you that Brian and I decided to stop trying to modify our kids to fit "the norm" a long time ago. Honestly, we feel like we've won the lottery by having two high school graduates (one recent culinary school grad and one college bound) that are social, ambitious, healthy, sweet and fun to be around. I tried to tell you that, but I don't think you could hear me. You seemed to think that I was settling or somehow selling them short. But now after writing all this, I think maybe the bottom line is that you and I have vastly different definitions of success. So you know what? Maybe you weren’t wrong after all. Maybe I was wrong for comparing my marriage to yours, comparing my babies to yours, comparing my teenagers to yours. I’m not trying to throw any shade on you or your family (live your life, girl!). But maybe if I had followed my own instincts, been truer to myself (and not spent all those years trying to be some slightly younger, Black version of you), I'm pretty sure that my family and I would have had a much different experience and quite frankly, probably a better one. And by the way, you were wrong about one more thing. Barbie's Black friend isn't Francie, her name is Christie. GET IT RIGHT, b*tch!